12 rooms with 12 bathrooms with shower and WC. TV TNT. 20 meters from free shuttles. - A ski room for dry shoes. Stairs leading to the cottage and terrace. - SPA 5 outdoor courts. Barbecue, garden furniture and table tennis in the summer only! - Input code, hall, office! Free wifi. - A large games room with stove, sitting area. Billiards, table football and hi-fi and dvd. - A large living room with fireplace and home theater. Many choices of free movies and SAT channel. -1 bar area with bar, bistro tables and stools with glass washer, wine cellar, large freezer, Senseo coffee machine and kettle, hi-fi. - A large fully equipped professional kitchen... 1 large oven and a kiln room! - A laundry with washing machine, dryer. Iron and ironing board Cots .2. - Service raclette, fondue, tartiflette, stone cooked 9 to 12€ and meats ..
- Service delivery of your purchases Benedict takes care of everything! rates pro ..
€30 handling fee in addition to rent. animations, Ski School "and Yoann and Freddy" come to take your kids or adults at the cottage directly, racket, training, day or half day, Handiski, snowboarding etc. Yoann www.ecoleskiacademy.com: 06.81.66.52.80 Service taxi ski!! 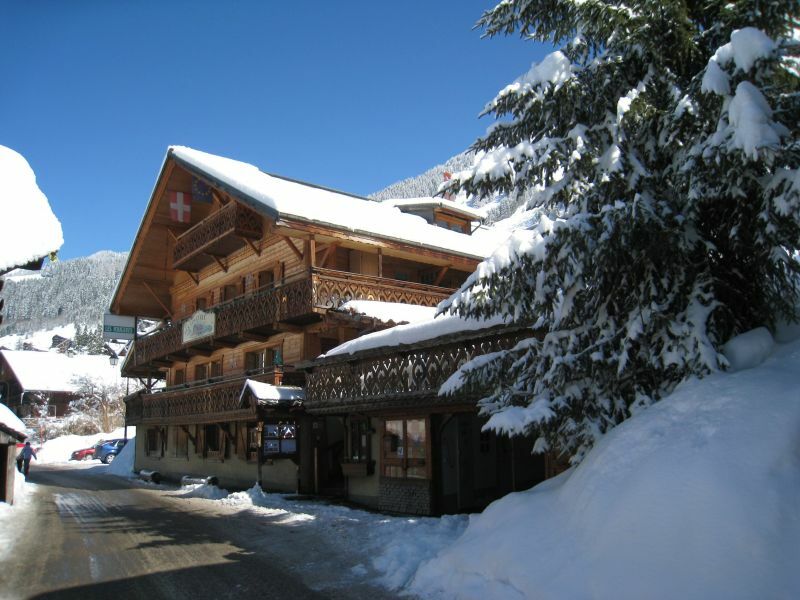 Châtel resort village and traditions, sports, gastronomy, welcomes you to the magic of its spaciousness and its wealth of mountain scenery in winter, skiing in sports or family, or Nordic skiing, snowshoeing, hiking and biking trails. Special offer: from April 14 to 21: €2800. In rear garden, inside steps directly to the dining room, with 2 bedrooms with 1 bed, with a bathroom (bath) + + 1 kitchen corner / TV and Internet! Week + 250 € + 50 € final cleaning. Winter week + 430 € + 50 € final cleaning. Bed linen included ..
Total 34 people on 500 sqm + 2 cots. Summer BBQ with garden on the terrace with spa, sleeps 5.
weekend arrivals at 10 AM, starting at your convenience. 3 km from the Swiss border: Morgins and 40 km Evian or Thonon les bains les bains, Ivory 50 km, Geneva 70 km, 120 km Annecy, Chamonix 70 km (1h30 by road through magnificent Switzerland!) Avoriaz by ski barely 30 minutes! Gare de Thonon les Bains: 40 km (45 minutes chattel) regular buses stop 20 meters from the cottage. Highway A 41 exit Thonon les Bains, Thonon then head to the baths 25 km! Thank you, in our good memory. Merci, en notre bon souvenir. - €330 final cleaning in winter. €300 for weekends and in summer multipass €1 per day unlimited activities in all resorts in the Portes du Soleil (10 resorts): pools, tennis courts, indoor ice rink, ski lifts, cultural center, train etc.